AMMAN, Jordan (AP) — Mideast powers opposed to President Bashar Assad have dramatically stepped up weapons supplies to Syrian rebels in coordination with the U.S. in preparation for a push on the capital of Damascus, officials and Western military experts said Wednesday. The Arab official said the number of arms airlifts has doubled in the past four weeks. He did not provide exact figures on the flights or the size of the cargo. Jordan opened up as a new route for the weapons late last year, amid U.S. worries that arms from Turkey were going to Islamic militants, all four told The Associated Press in separate interviews. Jordan denies helping funnel weapons to the rebels. The two military experts, who closely follow the traffic, said the weapons include more powerful, Croatian-made anti-tank guns and rockets than the rebels have had before. 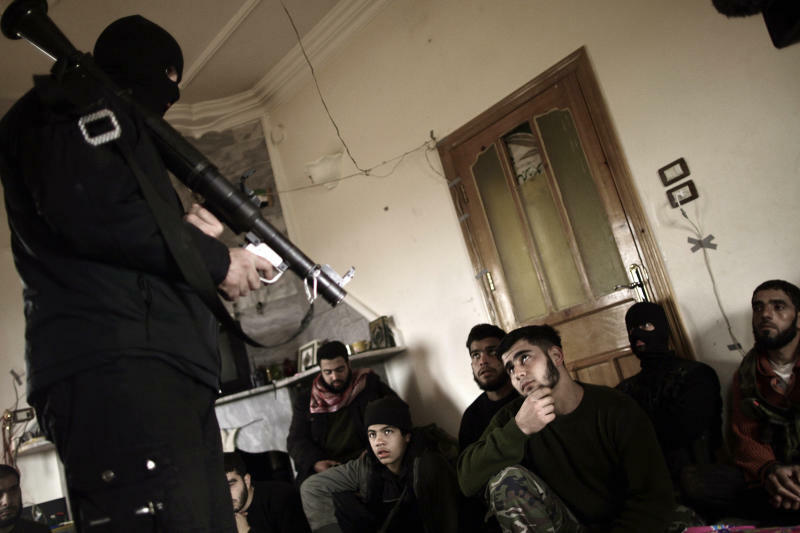 The Arab official said there was a "master plan" for the rebels to seize Damascus. He and the diplomat spoke to the AP on condition that their identities and their nationalities not be disclosed because the operation was covert. "The idea is that the rebels now have the necessary means to advance from different fronts — north from Turkey and south from Jordan — to close in on Damascus to unseat Assad," the Arab official said. He declined to provide details, but said the plan is being prepared in stages and will take "days or weeks" for results. Rebels have captured suburbs around Damascus but have been largely unable to break into the heavily guarded capital. Instead, they have hit central neighborhoods of the city with increasingly heavy mortar volleys from their positions to the northeast and south. But rebels in the south are fighting to secure supply lines from the border with Jordan to the capital, and the new influx of weapons from Jordan has fueled the drive, a rebel commander in a southwestern suburb of the capital said. The consensus among the multiple rebel groups was that Damascus is the next objective, he added. "There is an attempt to secure towns and villages along the international line linking Amman and Damascus. Significant progress is being made. The new weapons come in that context," said the commander, who spoke on condition of anonymity for fear of Syrian government reprisal. He said his own fighters on the capital's outskirts had not received any arms from the influx but that he had heard about the new weapons from comrades in the south. Syria's rebels, who are divided into numerous independent brigades, have long complained that the international community is not providing them with the weaponry needed to oust Assad, drawing out a civil war that in the past two years has killed more than 70,000 people and displaced 3.5 million Syrians, nearly a third of them fleeing into neighboring countries. But the United States in particular has been wary of arming the rebellion, fearing weapons will go to Islamic extremists who have taken a prominent role in the uprising. Washington says it is only providing non-lethal aid to the rebels. The U.S. involvement in the arms channels opened up by its regional allies is aimed at ensuring the weapons are not going to militants. The Arab official, the diplomat and the military experts said the material was destined for "secular" fighters not necessarily linked to the Free Syrian Army, the nominal umbrella group for the rebels. Jordan and other Arabs have been critical of the FSA, which they accuse of having failed as an effective or credible force because its elements lack the fighting skills and military prowess. The four described a system in which Saudi Arabia and Qatar provide the funding for the weapons, while Jordan and Turkey provide the land channels for the shipments to reach the rebels, while all coordinate with the U.S. and other Western governments on the shipments' destinations. All must agree for a shipment to go through. The Arab official said some of the arms are being purchased from Croatia, or from U.S. drawdowns in unspecified European countries. He said other sources were black market arms dealers across Europe and the Mideast. Jordanian Information Minister Sameeh Maayatah insisted the kingdom was not helping funnel weapons. "Jordan is neither assisting the Assad regime, nor its opponents," he told the AP. Instead, he argued, Jordan wants a "quick political solution" to the Syrian crisis. The Turkish Foreign Ministry would not confirm weapons transfer through Turkey, saying, "We have no official information to confirm such reports or claims." Initially, Turkey was the main route for arms smuggled to the rebels when the flow began in early 2012, but Washington was unhappy that some weapons ended up in the hands of militants, the four said in separate interviews with the AP. Subsequently, Jordan became an additional route, with the first airlift landing there Dec. 13, they said. Jordan insisted that its role remain clandestine so that it would not be at risk of reprisal by Assad's forces or rockets, they said. Jordan borders Syria to the south, and its frontier is within a two-hour drive of Damascus. 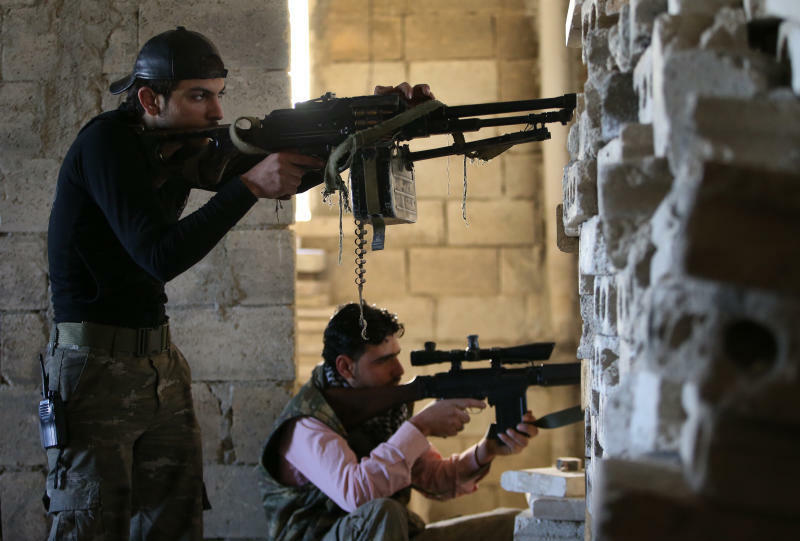 U.S. Secretary of State John Kerry said on the sidelines of a Syrian opposition meeting in Italy last month that the weapons are ending up in the hands of secular groups. "I will tell you this: There is a very clear ability now in the Syrian opposition to make certain that what goes to the moderate, legitimate opposition is in fact getting to them, and the indication is that they are increasing their pressure as a result of that," he said, without elaborating. Wrapping up a summit in Qatar on Tuesday, Arab states underlined their right to arm the Syrian rebels, noting the growing frustration with Assad's regime and with what is believed to be a supply of weapons flowing to his regime from his main ally, Iran. Turkey, Jordan, Saudi Arabia and Qatar are headed by Sunni Muslim governments seeking the fall of Assad's regime, which is dominated by Syria's Alawite minority, an offshoot of Shiite Islam. The Arab powers in particular are hoping Assad's departure would break the influence in the region of predominantly Shiite Iran and its Hezbollah allies in Lebanon. In an interview with the AP last week, Jordan's King Abdullah II said Assad's days were numbered, but warned of the risk that Syria might use chemical weapons against its neighbors, including Jordan. Traditionally, Damascus has been suspicious of its smaller southern neighbor, whom it accuses of being a U.S. puppet and a spy for Israel since the 1994 Jordanian-Israeli peace treaty. Despite the tensions, their common border has remained relatively quiet and open. The opening of the weapons pipeline through Jordan "provides a fresh approach" to Syrian rebels, said Shashank Joshi, a military expert who has been monitoring the arms flow for two years for Britain's Royal United Services Institute think tank. "This way opens a new front in southern Syria. It breaks free from connections with Saudi and Lebanese middlemen (in Turkey), while ensuring the weapons get to those rebels with secular, or nationalist ties, rather than the jihadists," he said. Sweden-based arms trafficking expert Hugh Griffiths, who has been monitoring the arms flow and collecting independent data, said some 3,500 tons of military equipment have been shipped to the rebels since the traffic began in early 2012. He said there were at least 160 airlifts of weapons deliveries from Saudi Arabia, Qatar and later Jordan, with the most recent being a shipment of unspecified material from Qatar to Turkey on Sunday. "Nothing compares in terms of the intensity of these flights over months-long periods at a time," said Griffiths, of the Stockholm International Peace Research Institute. Two prominent independent researchers monitoring weapons traffic — Eliot Higgins in Britain and Nic Jenzen-Jones in Australia — said Croatian arms began appearing only recently in Syria. They include M60 recoilless guns, M79 Osa rocket launchers, and RBG-6 grenade launchers, which all are powerful anti-tank weapons. Griffiths said the Croatian arms are a "major game changer." He said they are "portable, but pack a much bigger explosive punch." The question will be whether the arms influx will tip the balance if rebels do launch an offensive for Damascus — and whether the attempt to boost more moderate rebels over Islamists will be effective. Syrian opposition activists estimate there are 15-20 different brigades fighting in and around Damascus now, each with up to 150 fighters. Many of them have Islamic tendencies and bear black-and-white Islamic flags or al-Qaida-style flags on their Facebook pages. There is also a presence of Jabhat al-Nusra, one of the strongest Islamic militant groups fighting alongside the rebels. In the Damascus area, the al-Nusra fighters are active mostly in the Yarmouk Palestinian refugee camp, but the presence is not as strong as it is in the north and east. Capt. Islam Alloush, a spokesman for Liwaa al-Islam, a prominent rebel brigade with an Islamist ideology that is operating outside Damascus, denied any arms were being smuggled into southern Syria. "If there are any weapons being brought in, it would be from the north," he said. 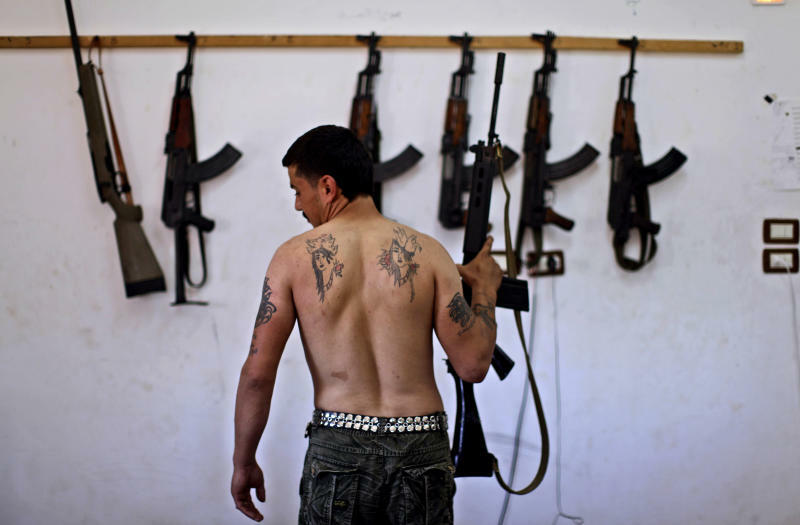 Still, he said rebels were gearing up for the battle for Damascus. "We have been preparing for it for a long time. We have our own strategy," he said. "God willing, the battle for Damascus will begin soon." Associated Press writers Zeina Karam and Bassem Mroue contributed reporting from Beirut.